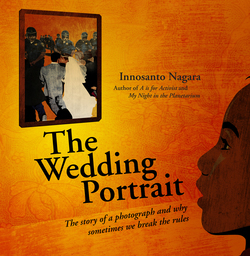 Children’s book author and illustrator Innosanto Nagara’s books encourage children to grow up with confidence in themselves, and to be proactive citizens who are passionate about causes from environmental issues to LGBTQ rights and civil rights. Born and raised in Indonesia, Inno moved to the US in 1988. After studying zoology and philosophy at UC Davis, Inno moved to the San Francisco Bay Area, working as a graphic designer for a range of social change organizations before founding the Design Action Collective, a worker-owned cooperative design studio. 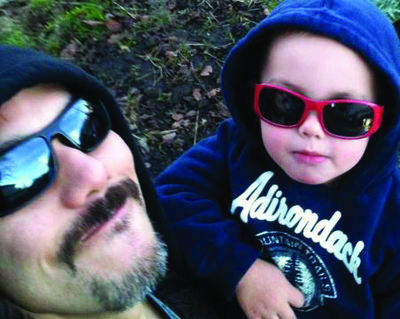 Inno lives in Oakland in a cohousing community with nine adults and eight kids. Inno’s first book, A is for Activist, started a movement in social justice book publishing for children. 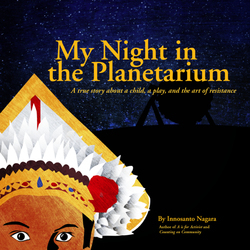 After it came Counting on Community, then My Night in the Planetarium and The Wedding Portrait. 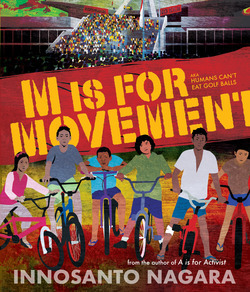 M is for Movement is the fifth title written and illustrated by Innosanto Nagara. Inno’s books stand in solidarity with people of all ages, races, gender identifications, and backgrounds. They suggest that your family isn’t only yourself and your parents but also the community in which you live, the histories of those around you, and the natural environment on which we depend for our food and water and air. The ideas in Inno’s books may sometimes sound controversial, but they speak to us in a language that is pure common sense and in tune with our natural wishes and inclinations as human beings.